The Brussels Griffon is a small companion breed that was originally developed from ratters working in the stables of Belgian carriage men. The Fédération Cynologique Internationale (FCI) recognize them as one of three different breeds of griffon from Belgium, the other two being Belgian Griffon and Petit Brabançon. The American Kennel Club and Kennel Club recognize all varieties as a single breed. The Brussels Griffon descends primarily from the extinct Griffon d’Ecurie. These dogs were kept specifically to exterminate vermin from carriage stables. It is unknown how long they existed, but dogs of this type are in paintings dating back to the 1400s. While they were an established breed, they were variable in appearance. Each line and region would have had its own preferred type based on working abilities. ​ During the late 1700s and 1800s, other breeds were added to the bloodline. No records were kept, but the Pug was almost certainly used. It would have added the pushed in nose and a smooth coated variety. Many experts also believe the King Charles Spaniel (English Toy Spaniel) likely contributed. After these crossings, the Griffon d’Ecurie no longer existed. These dogs were smaller, and their instinct for killing rats lost. Smooth coated dogs became known as the Petit Brabançon. The wiry dogs took on two separate names. 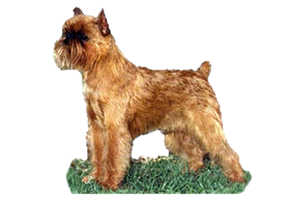 The solid red became the Brussels Griffon, and all other color combinations became the Belgian Griffon. By the 1880s the Belgian griffons’ first standard appeared in the Belgian kennel club’s studbook. Queen Marie Henriette had also taken a liking to the breed, which elevated their status. As a promoter of these dogs, she helped them get noticed outside of Belgium. Before WWI they had strongholds in both England and the United States. Belgium suffered greatly during WWI and the numbers of all dogs heavily declined afterward. Recovery efforts were slow and WWII was even more detrimental. By the end of both wars, the Belgian griffons (and many other breeds) were virtually extinct in its homeland and most of Europe. However, the United Kingdom still had a large population, which allowed the breed to recover with help from other countries such as the United States. Is the Brussels Griffon Right for You?